150 Beacon is located on the north side of Beacon, between Berkeley and Clarendon, with 148 Beacon to the east and 154 Beacon to the west. 150 Beacon was designed by architect Alexander Wadsworth Longfellow, Jr. and built in 1904-1905 by Frank L. Whitcomb, builder, as the home of Eben Sumner Draper and his wife, Nannie (Bristow) Draper. Eben Draper is shown as the owner on the original building permit application, dated October 29, 1904. They previously had lived at 90 Marlborough. 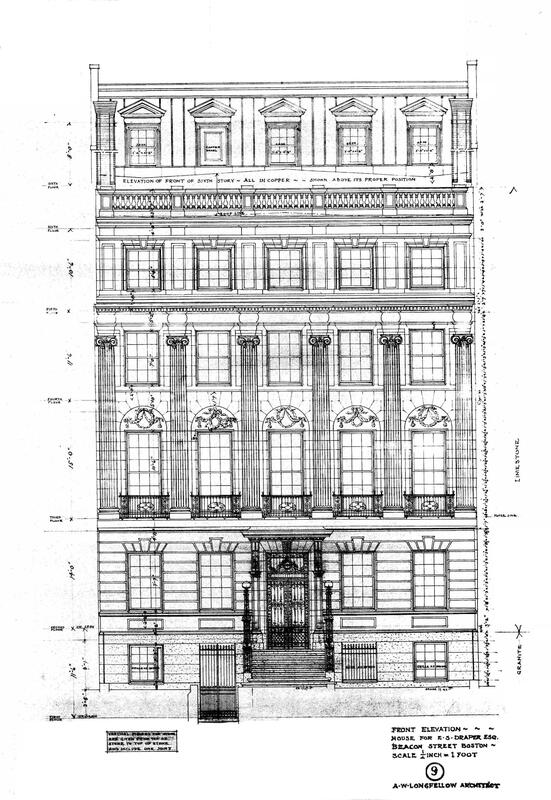 Architectural plans for the house — including elevations, foundation plans, floor plans, and floor framing plans — are included in the City of Boston Blueprints Collection in the Boston Public Library’s Arts Department (reference BIN A-98). Click here for an index to the deeds for 150 Beacon. The house replaced two houses built ca. 1860 and previously owned (as a single residence) by John Lowell Gardner, Jr., and his wife, Isabella (Stewart) Gardner. Eben Draper purchased the houses from Isabella (Stewart) Gardner on June 9, 1904, and they were razed soon thereafter. Eben Draper was a manufacturer of cotton machinery in the firm founded by his father in Hopedale. He served as Lieutenant Governor of Massachusetts in 1906-1908, and as Governor in 1909 and 1910. On October 5, 1909, less than five years after it was completed, 150 Beacon suffered a major fire which destroyed the entire interior, leaving only the walls intact. After inspecting the damage, he commented to the Boston Globe the next day that “there was not a thing left as large as a finger that I could take as a souvenir.” The house was rebuilt under the direction of the original architect and builder. 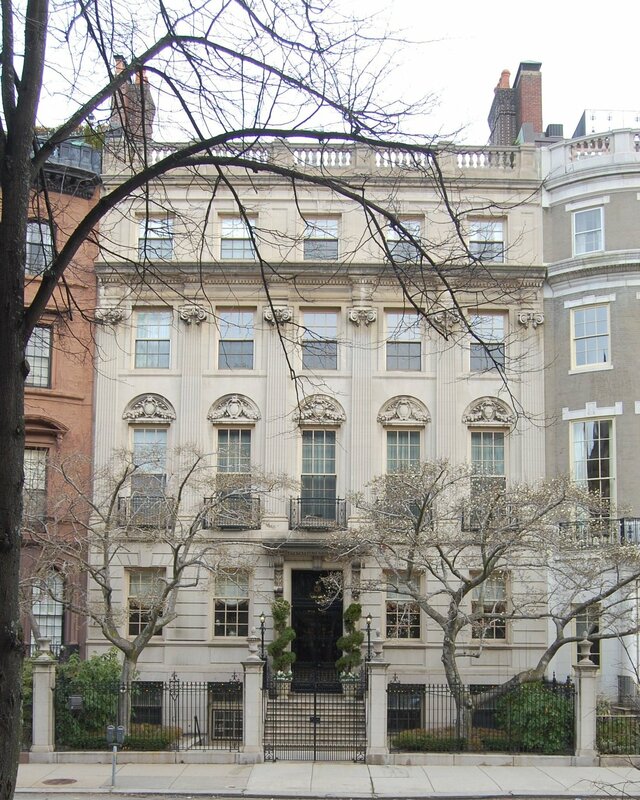 While the house was being rebuilt, the Drapers lived at 299 Berkeley with Anne Phillips, the widow of John C. Phillips. Nannie Draper died in September of 1913 and Eben Draper died in April of 1914. On August 13, 1914, Eben Draper’s estate transferred 150 Beacon to his daughter, Dorothy (Draper) Gannett, wife of banker Thomas Brattle Gannett, Jr. They previously had lived at 180 Beacon. The Gannetts continued to live at 150 Beacon during the 1918-1919 winter season, but were living in Manchester by 1920. 150 Beacon was not listed in the 1920 Blue Book. On March 15, 1920, 150 Beacon was purchased from Dorothy Gannett by Flora Anabella (Tufts) Fuller, the widow of Alvan Bond Fuller. She lived in Rye Beach, New Hsmpshire. 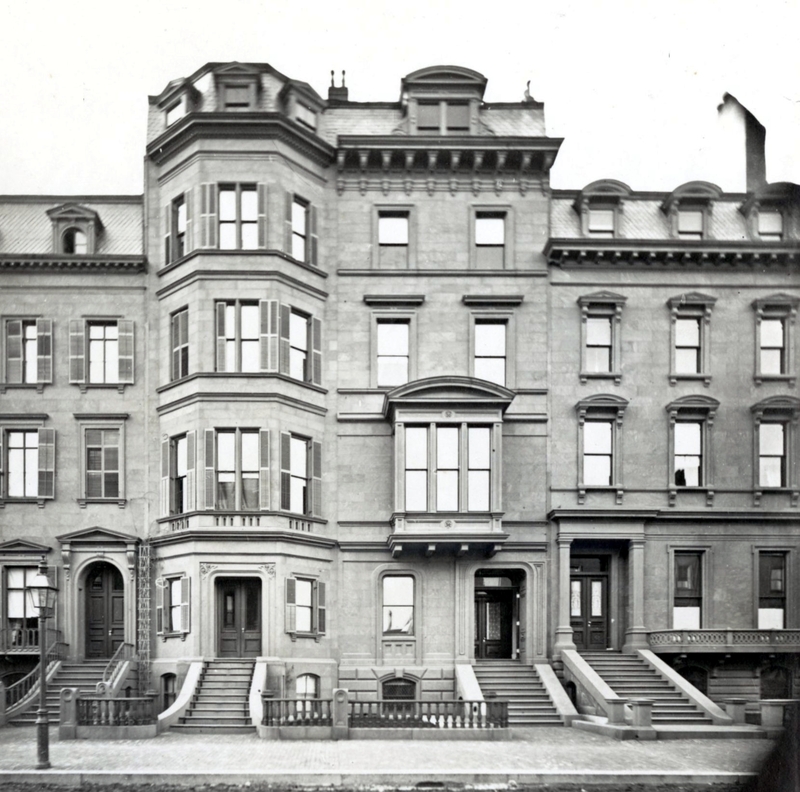 150 Beacon became the home of Flora Fuller’s son and daughter-in-law, Alvan Tufts Fuller and Viola (Davenport) Fuller. They previously had lived in Malden. They also maintained a home, Runnymeade-by-the-Sea, in Little Boar’s Head, New Hampshire. Alvan Fuller was an automobile dealer, the first distributor of Packards in New England. In 1914, he was elected to the Massachusetts House of Representatives, serving from 1916 to 1920. He subsequently was elected Lt. Governor and, in 1924, he defeated Boston Mayor James Curley for Governor. He was reelected in 1926. Prior to their marriage in 1910, Viola Davenport had performed in the “debutante series” of the Boston Opera, making her debut in Lakmé on November 20, 1909. On December 4, 1930, Flora Fuller transferred 150 Beacon to Viola Fuller. Alvan Fuller died in April of 1958, and Viola Fuller died in August of 1959. 150 Beacon was shown as vacant in the 1961 City Directory. On January 26, 1960, 150 Beacon was acquired from Viola Fuller’s estate by Norman Saul Rabb (Nathaniel Rabinovitz), vice president of Stop and Shop grocery stores (founded by his father, Joseph Rabinovitz), and his wife Eleanor Ruth (Epstein) Rabb. They lived in West Newton. On April 14, 1961, 150 Beacon was acquired from the Rabbs by Emerson College. In July of 1961, it applied for (and subsequently received) permission to convert the property from single-family dwelling into a dormitory and dining quarters. In 1966, Emerson College acquired 148 Beacon and, in May of 1967, it filed for (and subsequently received) permission to combine 148 Beacon with 150 Beacon, with the use of the combined buildings being as a school. In April of 1976, the college filed for (and subsequently received) clarification that 148-150 Beacon was being used for dormitory and dining quarters, and in July of 1976. it filed for (and subsequently received) clarification that the upper floors could be used as a library. On September 27, 1999, Emerson College sold 150 Beacon to 150 Beacon Associates LLC (Enrique Darer, manager of record) and sold 148 Beacon to Joseph T. Doyle, Jr., trustee of the 148 Beacon Street Realty Trust. The properties were separated from each other, and in October of 1999. 150 Beacon Associates filed to convert the property into seven apartments, including constructing a 470 square foot addition on the roof. They subsequently withdrew their proposal for the rooftop addition. 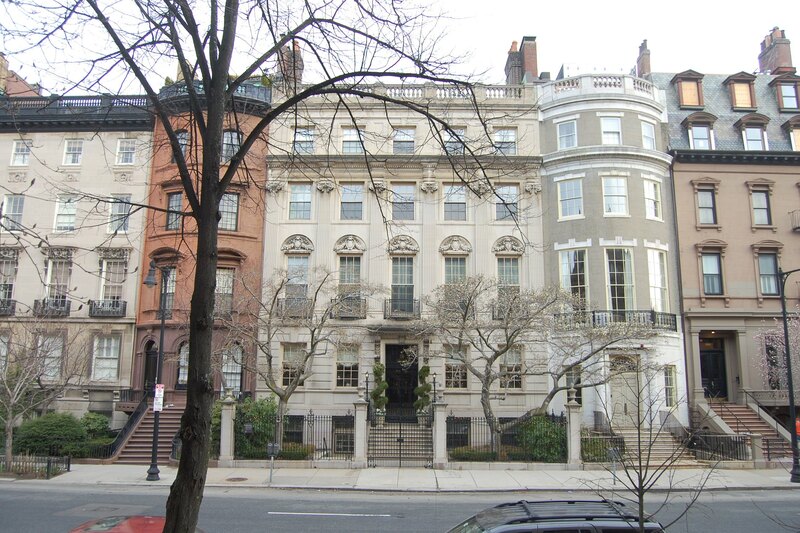 On March 1, 2001, 150 Beacon Associates LLC converted 150 Beacon into six condominium units, the 150 Beacon Street Condominium. 150 Beacon was built ca. 1860 as the home of Barnabas Thayer Loring and his wife, Phebe Farnum (Southwick) Loring. They previously had lived at 48 Pinckney. Barnabas Loring purchased the land for 150 Beacon from the Boston and Roxbury Mill Corporation on November 21, 1859. The house was originally numbered 125 Beacon, but re-numbered as 150 Beacon ca. 1862 when homes were built on the south side of the street. Click here for an index to the deeds for 150 Beacon (Demolished). Barnabas Loring was a boot and shoe manufacturer and wholesale leather merchant. The Lorings continued to live at 150 Beacon until about 1870, when they moved to Braintree. On November 10, 1871, 150 Beacon was purchased from Barnabas Loring by tea merchant Horace Dudley Hall. He and his wife, Abbie F. (Allen) Hall, lived in Medford. On November 10, 1871, 150 Beacon was acquired from Horace Hall by Andrew Robeson, Jr. He and his wife, Mary (Allen) Robeson, made it their home. They previously had lived at 22 Beacon. They also maintained a home in Tiverton, Rhode Island. Andrew Robeson was a textile mill owner in Fall River, his father having constructed the first calico printing mill in the area. In 1842, he built a granite mansion in Fall River, later the location of the Fall River Historical Society. He was an abolitionist and his home was a station on the underground railway. The Robesons’ two unmarried children – Andrew Robeson, III, and Mary Allen Robeson – lived with them. Their third daughter, Alice, had married in November of 1870 to Stephen Van Rensselaer Thayer, who had died in October of 1871 while they were living at 6 Commonwealth. Mary Allen Robeson married in November of 1873 to Charles Sprague Sargent, a horticulturalist and first director of the Arnold Arboretum. After their marriage, they lived in Brookline. Andrew Robeson died in July of 1874. 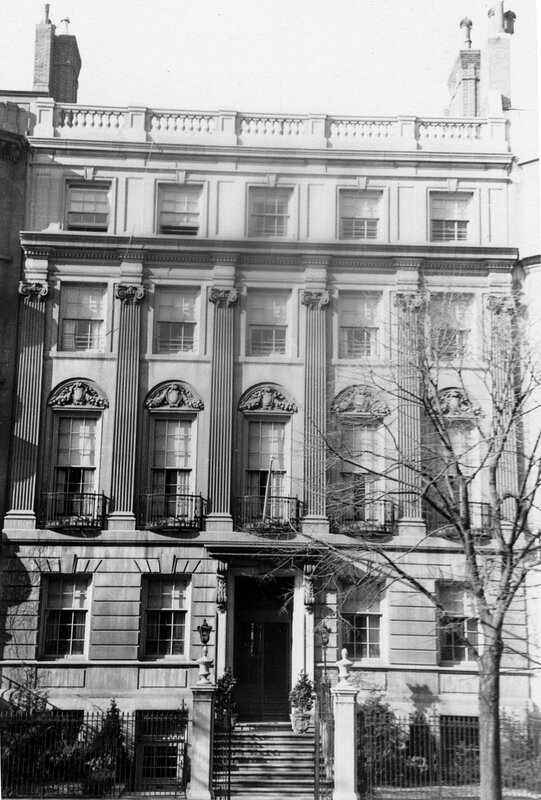 150 Commonwealth was inherited by his three children. Mary (Allen) Robeson continued to live at 150 Beacon with her son, Andrew, a cotton manufacturer. On April 26, 1878, he mortgaged his one-third interest in 150 Beacon to his maternal grandfather, Zachariah Allen of Providence. Andrew Robeson married in March of 1880 to Abby Frances Knight. After their marriage, they lived in Fall River. 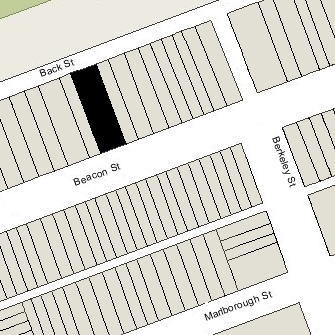 His mother moved from 150 Beacon at about that time and by the 1880-1881 winter season was living at 267 Clarendon. On May 5, 1880, Alice (Robeson) Thayer and Mary (Robeson) Sargent sold their interests in 150 Beacon to John Lowell Gardner, Jr. On the same day, Zachariah Allen foreclosed on his mortgage to Andrew Robeson and sold the property to real estate dealer Henry Winsor, Jr., who then transferred it to John L. Gardner, Jr.
John L. Gardner, Jr., and his wife, Isabella (Stewart) Gardner, lived at 152 Beacon, and soon after acquiring 150 Beacon they combined the two houses, with the address of 152 Beacon. On January 4, 1897, John L. Gardner transferred 150 Beacon to his wife. 152 Beacon was built ca. 1860 for New York importer and mine owner, David Stewart, on land which he purchased from the Boston and Roxbury Mill Corporation on November 28, 1859. He built the house as a wedding present to his daughter, Isabella, who married John Lowell Gardner, Jr., in April of 1860. The house was originally numbered 126 Beacon, but re-numbered as 152 Beacon ca. 1862 when homes were built on the south side of the street. The Gardners also maintained homes in Brookline and Beverly. Click here for an index to the deeds for 152 Beacon (Demolished). Prior to their marriage, John L. Gardner, Jr., had lived at 7 Beacon with his parents, John Lowell Gardner and Catherine Elizabeth (Peabody) Gardner (they later would moved to 182 Beacon). He was associated with his father’s firm, shipping merchants in the East India and Russian trade, and also served as Chairman of the Board of the Chicago, Burlington & Quincy Railroad. In March of 1865, the Gardners’ only child, John, III, died. Ten years later, John Gardner’s young nephews — Joseph Peabody Gardner, Jr., William Amory Gardner, and Augustus Peabody Gardner — were orphaned when their father, Joseph Peabody Gardner, died in June of 1875 (their mother, Harriet Sears (Amory) Gardner had died ten years earlier). John and Isabella Gardner took the boys into their home and raised them. Prior to their father’s death, they had lived at 147 Beacon. In May of 1880, John L. Gardner, Jr., purchased 150 Beacon. Soon thereafter they combined the two houses, with the address of 152 Beacon, to provide greater space for the display of the growing art collection being assembled by Isabella (Stewart) Gardner. The remodeling was designed by architect John Hubbard Sturgis and completed in 1881. On April 18, 1887, David Stewart transferred 152 Beacon to his daughter. John L. Gardner, Jr., died in December of 1898, and Isabella Gardner purchased land in the Fenway area and began plans for construction of her Fenway Court museum and residence. 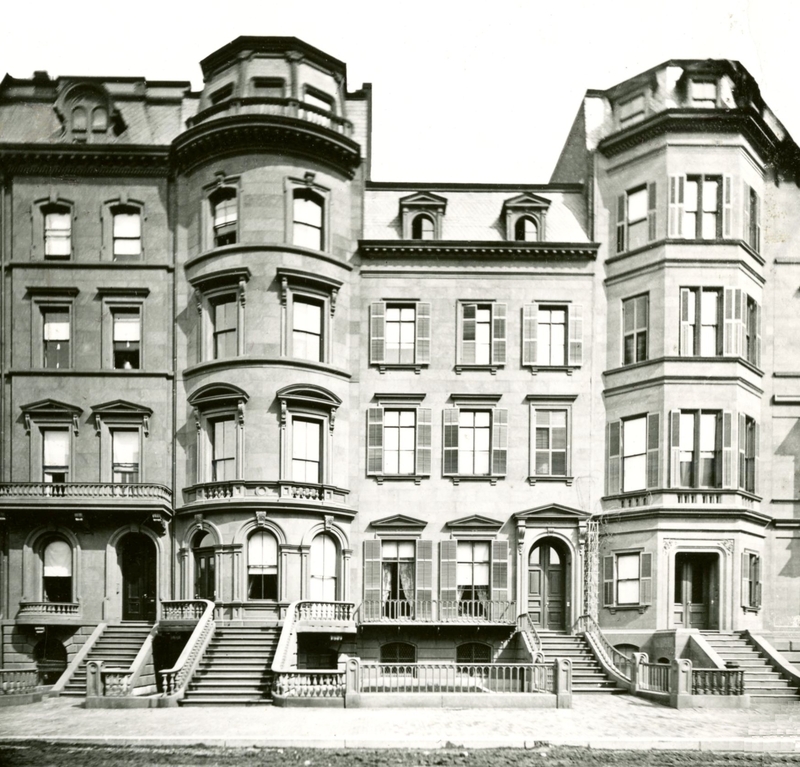 She continued to live at 150-152 Beacon until about 1902, when Fenway Court was completed. On June 9, 1904, Eben Draper purchased 150 and 152 Beacon and razed them for his new residence.